Heading into autumn tends to trigger a few of those reminder bells in your head. Perhaps checking on your custom orthotics isn’t one of them yet, but we’re not here to judge. However, if you do currently have custom orthotics, this period of time toward the end of the year is a good spot to set yourself a reminder. Among Halloween, Daylight Savings, Thanksgiving, Christmas, and the New Year, think about penciling in some time with us to see whether your orthotics need refurbishing. While custom orthotics are built to be as durable as possible, nothing is invincible. As we walk, we place a heavy amount of force on whatever is supporting us. Just as shoes tend to wear out and change as we use them, so too do orthotics. A yearly review of your orthotics tends to be a good base point to work from. However, if you are quite active and get a lot of use out of your shoes, it might be recommended that your orthotics be checked sooner than that. There is also the chance with some patients that the structure of their foot has changed. As orthotics are custom-designed to fit a specific shape, having this target shape alter will place extra stress on the orthotic in certain areas. It will also naturally be less effective in supporting the structure of the foot as a whole! What Are Signs My Orthotics Need Refurbishing or Replacing? If you have had your orthotics for a number of months, the signs they might need an update or replacement do not always lie with the inserts themselves. Yes, you might very well see wear, cracks, or broken pieces on the devices themselves, and that is definitely a sign that they should be examined by us. Are your shoes wearing out unevenly? For many who needed orthotics in the first place, this was a sign of imbalance. Of course, if you’re still wearing the same pair of shoes you had before you got the orthotics, this won’t help. But if new shoes are still showing uneven wear along the side of the heel or the front of the foot, it’s a sign that an imbalance is still in play. Either your orthotics have worn out to be less effective, or they haven’t been to begin with. Do you have calluses on your feet? Whereas uneven wear in your shoes is a sign of unbalanced forces, calluses can be a sign of the same on your feet. Calluses are a sign that too much friction is taking place at the site of the condition. Pain along the foot or ankle. Pain is always a sign of a potential problem. If it is felt in the arch, the heel, or along the inside of the ankle, the likelihood of orthotics needing adjustment is more likely. Even if you’re not sure a pain is “severe enough” for attention, it’s always worth giving us a call. A slightly annoying pain can become a chronic issue if not addressed properly. Even if you have no obvious signs of needing refurbishment or replacement, it is still very much worth a check-up if you have undergone any sort of life change that could have a significant impact on your feet. Such changes include losing or gaining a lot of weight, pregnancy, and knee or ankle surgery. Any of these factors can have an impact on your biomechanics (the way you walk), and your orthotics may have to be adjusted as necessary. What Does an Orthotic Checkup Look Like? When reviewing your orthotics, it’s not uncommon that some questions will be brought up about your foot and ankle comfort and any changes in lifestyle. As noted above, these can be signs that an adjustment is needed. You might also be asked if you have had any recent injuries. You should naturally bring your orthotics to the exam, as well as a pair of shoes you have worn regularly for several months. If you are in the market for a new pair of shoes, it may be wise to hold off until after the appointment. We may have recommendations for shoes that might better suit your needs and your orthotics! Along with questions, we may also perform a biomechanical exam of your feet and ankles. This can involve reviewing range of motion, posture, gait while walking (or sometimes running), and how you stand barefoot with shoes/orthotics on. The orthotics will also be checked for general condition as well as whether they are still the right length, width and shape to properly support your foot. Inserts that are not doing the best possible job will be recommended for adjustment or replacement. If the orthotics are being adjusted or refurbished, you may have to leave them with us and pick them up later. We will be sure to inform you how long you might have to wait. 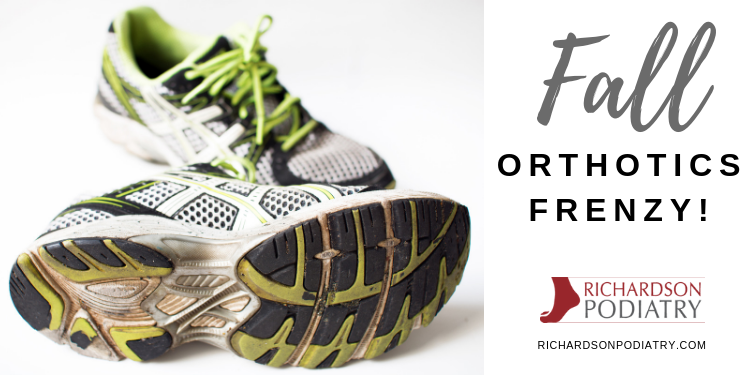 Whether you have had your orthotics for a year, feel you might be having problems, or believe you might need orthotics in the first place, Richardson Podiatry Center is here for you. Call us at (972) 690-5374 or toll-free at (855) 919-4548 to schedule an appointment with our office. You may also fill out our online contact form to have a member of our staff reach out to you.